This artist's rendering shows planet KELT-1b, which resides so close to its star that it completes a "yearly" orbit in a mere 29 hours. Think of it as a win for the little guys. Astronomers using a small ground-based telescope have discovered two unusual alien planets around extremely bright, distant stars. The two extrasolar planets are gas giant worlds detected using the Kilodegree Extremely Little Telescope (KELT) in southern Arizona, which has a lens that is roughly as powerful as a high-end digital camera, the researchers said. 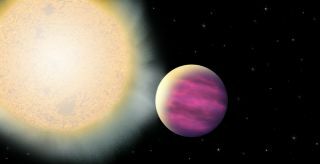 "KELT is slightly more diminutive than Kepler, but we like to think it's small but fierce," said Thomas Beatty, a doctoral student at Ohio State University in Columbus. NASA's Kepler space telescope is an orbiting observatory specially built to seek out distant planets. Beatty presented the findings on June 13 at the 220th meeting of the American Astronomical Society in Anchorage, Alaska. These types of alien worlds are known as "hot Jupiters" because they are gas giant planets that orbit extremely close to their parent stars. KELT-1b is so close to its host star that it completes one orbit in a mere 29 hours. Being this close to its star, the planet's surface temperature is likely above 4,000 degrees Fahrenheit (roughly 2,200 degrees Celsius), in the process receiving 6,000 times the amount of radiation that Earth receives from the sun, Beatty explained. "[It] resets the bar for weird," he said. "It's the sort of object that we would not have expected to find this close to its parent star." KELT-1b is located approximately 825 light-years away in the constellation of Andromeda. The massive planet stood out to astronomers not only because of its close proximity to its parent star, but because of its unusual orbital dynamics. "It's massive enough that KELT-1 has raised tides on its parent star and actually spun it up," Beatty said. "KELT-1 grabbed the star it's around, pulled it so it's spinning at the same rate, so now both KELT-1 and its parent star are locked in each other's gaze as they go around." The other newly identified planet is called KELT-2Ab, and is located about 360 light-years away in the constellation of Auriga. The alien world is 30 percent larger than Jupiter with 50 percent more mass. This discovery more closely resembles other exoplanets found to date, except KELT-2Ab's parent star is so bright it can be seen from Earth through binoculars. In fact, the star is so luminous that researchers will be able to make direct observations of the planet's atmosphere by examining light that shines through it when the star passes within KELT North's field of view again in November. Follow-up observations are also being planned using other ground-based instruments, as well as several space observatories, including the Hubble Space Telescope and the infrared Spitzer Space Telescope. "We want to look at what's going on in its atmosphere and its interior," Beatty said. "The reason why individual hot Jupiters like these are still interesting is because we still fundamentally do not understand what goes on inside them." KELT-2Ab orbits a star that is slightly bigger than the sun, within a binary system called HD 42176. In this system, one star is slightly bigger than our sun, and the other star is slightly smaller. KELT-2Ab orbits the bigger star, which is bright enough to be seen from Earth with binoculars. Astronomers use KELT to find large planets orbiting very bright stars using the so-called transit method, which involves watching for tiny dips in the star's light that could indicate a planet is crossing, or transiting, in front. Rather than staring at a small group of stars at high resolution, the twin KELT North and KELT South telescopes observe millions of very bright stars at low resolution, the researchers said. KELT North scans the northern sky from Arizona, while KELT South covers the southern sky from Cape Town, South Africa. While NASA's prolific Kepler Space Telescope has identified roughly 2,300 alien planet candidates, the small ground-based KELT telescopes provide a low-cost alternative for exoplanet hunters by primarily using off-the-shelf technology. The hardware for a KELT telescope costs less than $75,000, the researchers said.